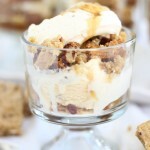 Maple Pecan Blondie Sundae Parfaits. We love Blue Bunny® ice cream, and as soon as it starts to feel remotely like spring, we start craving it. In the warmer months, it’s so refreshing and satiating. We’ll eat it in the winter too – this is Florida after all – but it’s especially satisfying in the spring and summer. 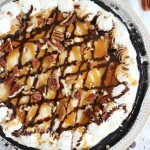 We eat it for dessert after dinner almost every night from spring through summer! We are ice cream people, for sure, and it’s one of my favorite treats. It’s one of those foods that tends to disappear in our house pretty quick. Occasionally I’ll reach for a container in the freezer, and it will feel much lighter than I was expecting. Someone in the house makes substantial dents in our ice cream stash when I don’t realize it, and it’s NOT the cat. I kept craving maple blondies in the fall, but I never got the chance to make them. 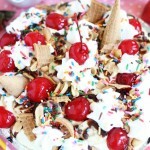 I decided to give them a spring makeover by incorporating them into sundae parfaits with ice cream. 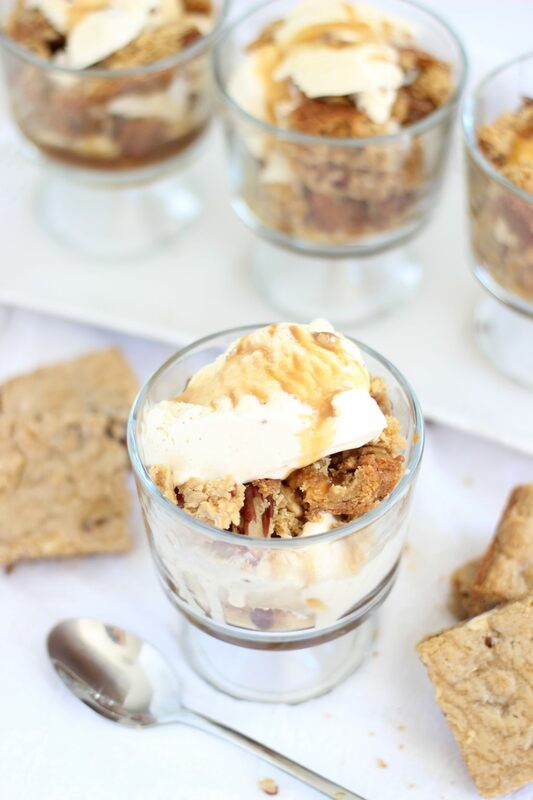 I used the Blue Bunny® Butter Pecan in these parfaits. 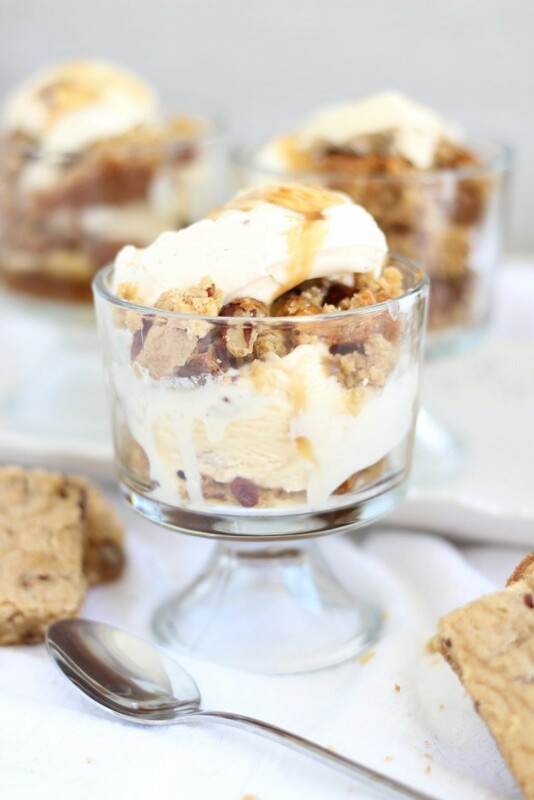 These Maple Pecan Blondie Sundae Parfaits are heavenly. I made my favorite Maple Pecan Blondies – imagine the chewiest and most brown-sugary blondies you’ve EVER had. They are incredible. So much brown sugar in them! 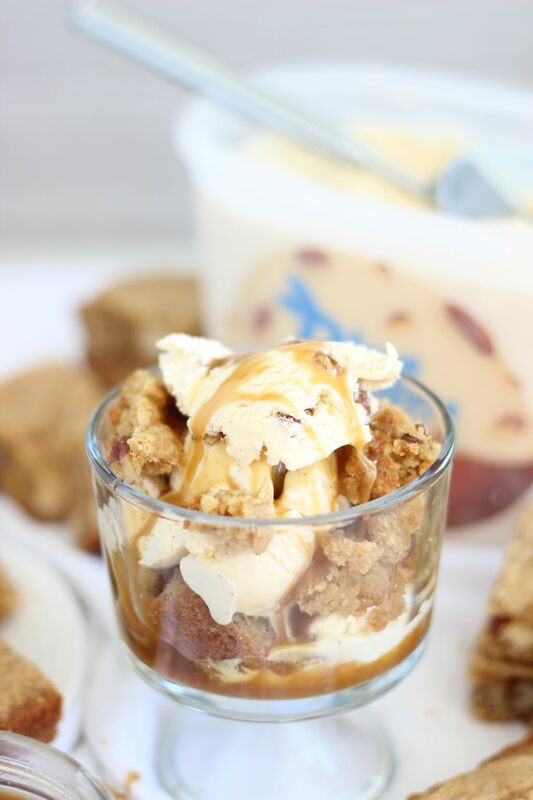 I crumbled up the blondies and layered them with Blue Bunny® Butter Pecan ice cream and a maple butter sauce to make these parfaits. 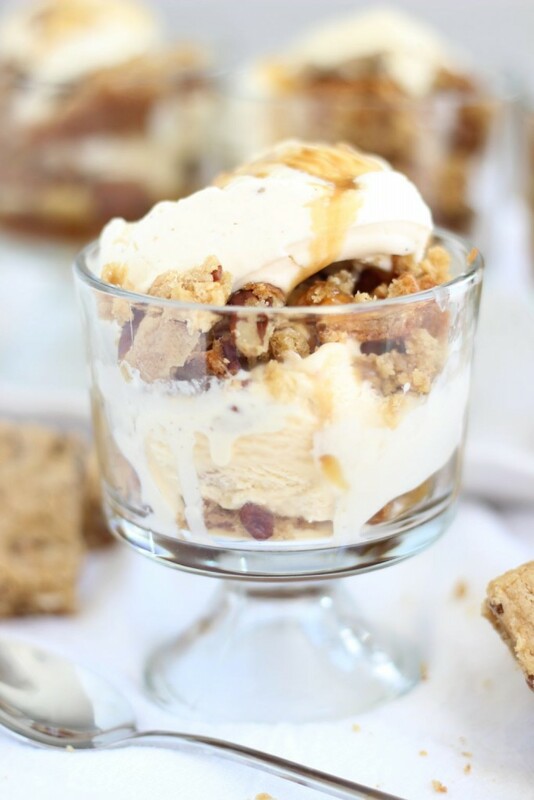 The creamy ice cream melts and seeps into the blondie crumbles, and mixes with the maple butter sauce. These parfaits are heaven on earth, I’m telling you! 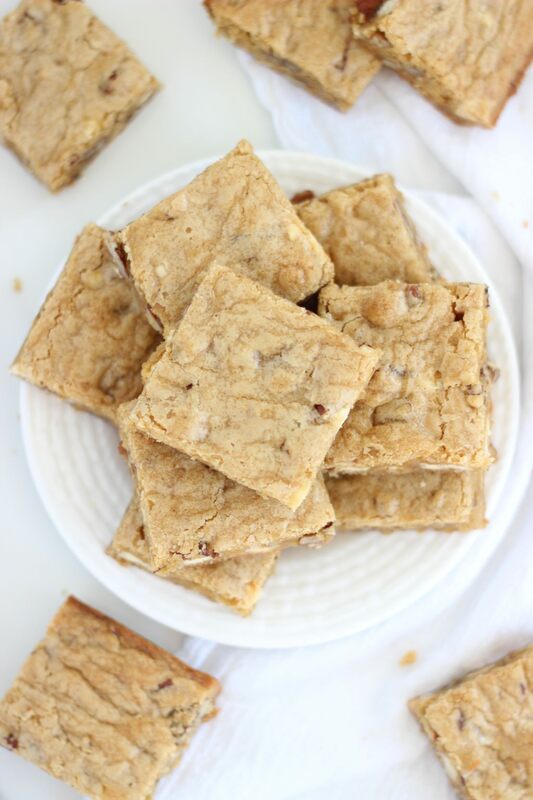 The blondies are from scratch, and are seriously the most flavorful and chewy blondies you can find. The maple butter sauce uses a short cut. If I’m already making blondies from scratch, I’m going to cut a corner somewhere else! I used a jar of prepared caramel sauce, and doctored it up with heavy cream, melted butter, and maple extract, for an amazing (and quick) maple butter sauce. Much better than cooking it up from scratch. These parfaits make for an amazing spring dessert with refreshing and rich Blue Bunny® ice cream, and delicious springtime flavors! In a medium bowl, whisk together brown sugar, butter, eggs, and maple extract. Fold the wet ingredients into the dry ingredients, mixing until just combined. 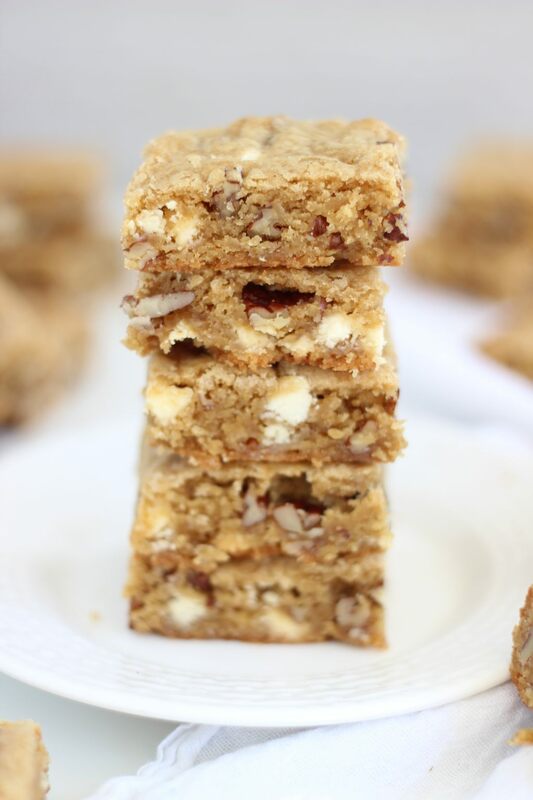 Fold in the pecans and white chocolate chips, careful not to overmix. The mixture will be quite thick. Spread into the bottom of a greased 9x13-inch baking pan. Bake at 350 degrees for 22-25 minutes, or until edges are golden brown, the top is shiny and crackled, and a toothpick inserted near the center comes out clean. Cool completely in pan on a wire rack. Cut into 24 bars. In a small microwave-safe bowl, heat the caramel sauce for 30-60 seconds, or until thin and runny. Whisk in the heavy cream and maple extract. Crumble 1 blondie bar into the bottom of each of 6 parfait glasses. 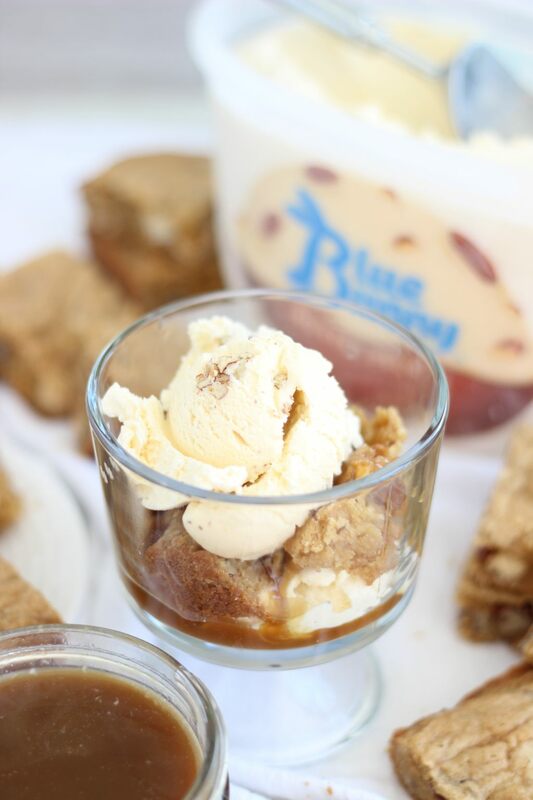 Top with a heaping tablespoonful of Blue Bunny® Butter Pecan ice cream, and a tablespoonful of maple butter sauce. Repeat so that each parfait has two layers of blondie, ice cream, and maple butter sauce. Oh, and you’ll have extra blondies leftover than you need for the parfaits, but I’m assuming that’s cool with you, yes? The blondies ARE amazing. 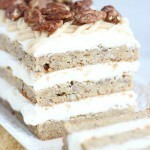 They are sooo incredible, and the parfaits altogether are definitely a new favorite blog recipe! Thanks so much! I’ve never made blondies, but I remember having them as kids! These look amazing! 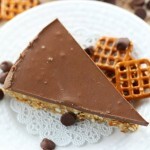 What a super delicious looking recipe!! We will be trying it out once the weather warms up here in Michigan. Sharing with my followers and pinning to try later. Thanks for sharing on Inspire Me Monday. Have a great weekend!! So heavenly, indeed! We are ice cream people, too. And the blondies make it look so tasty! 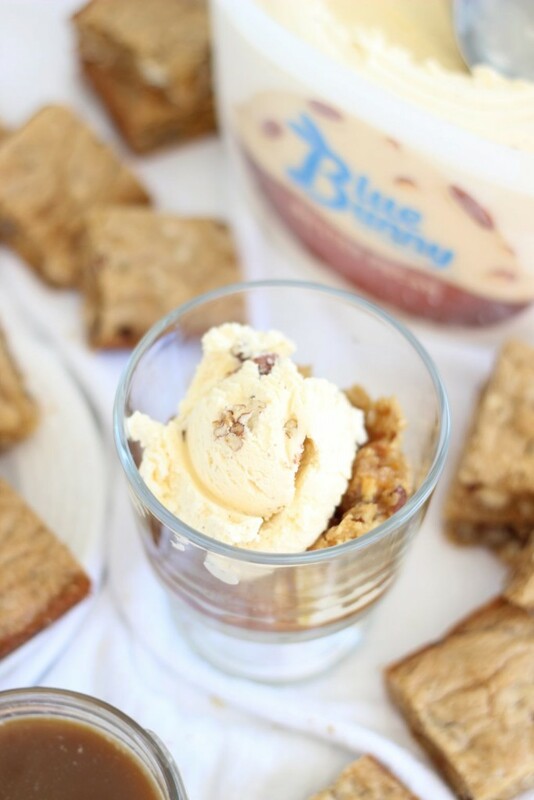 You had me at maple blondies, then you added blue bunny! Thanks for sharing on the Creative K Kids Tasty Tuesdays Linky Party. I hope you will join us again next week. 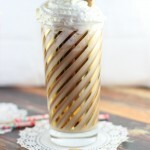 Oh man, I would love one of these right now! Thanks for linking up with What’s Cookin’ Wednesday! lol – It’s not the cat!! These look so scrumptious, I’m going to have to do this soon – it makes dessert seem so special! Thanks for bringing this by Throwback Thursday last week! Yep, definitely not the cat. Lol! Thank you so much!